• 8 x Wieland socket oulets. • Dimming signal loop IN and OUT. • Dimming sensor input for connection of a mains powered sensor. • LED status feedback on power and sensor condition. The SET-MB9D is a nine way Marshalling Box which distributes mains power, emergency feed and a dimming signal for up to nine light fittings. 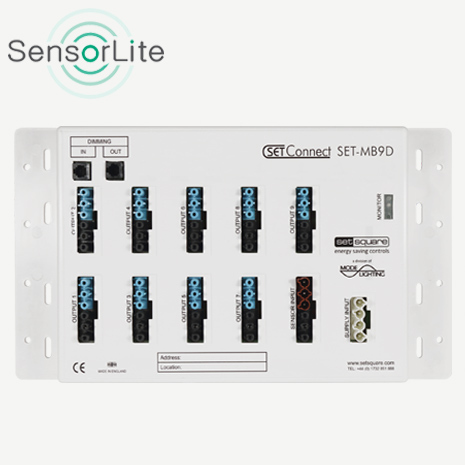 The box is designed to be used in conjunction with the SET-SEN-DIM range of mains powered presence and light level sensors. The built in sensor port neatly powers the remote sensor and also receives the dimming signal back to distribute it around the light fittings. The SET-MB9D can also distribute DALI signals from other Mode Lighting systems such as eDIN, utilising the RJ12 sockets, loop in and out.